66 roses arrange a large and very beautiful bouquet, vases or baskets. This 66 roses mean nothing gonna change my love for you. It is good to send this bouquet for the wedding anniversary or any occasion. Please choose our arrangements that you like on the website. 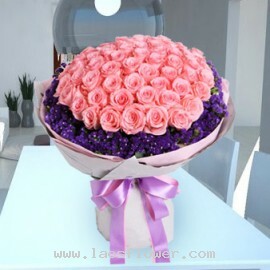 A bouquet of 66 pink roses accent with purple statice flowers around the bouquet. Wrapped in light pink and light gray outer layer. Tied with a pink bow. This bouquet is good to send to your loved ones on the wedding anniversary. To show that your love never changes from the first day. 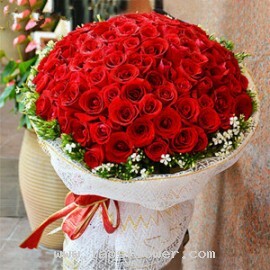 Occasional..
A bouquet of 66 red roses arrange in round shape. Wrapped with white mesh and tie with red bow. This bouquet is perfect for your marriage proposal or a wedding anniversary gift or as a birthday gift. You can choose the color of roses as you want such as white, yellow, orange, pink, purple or peach. 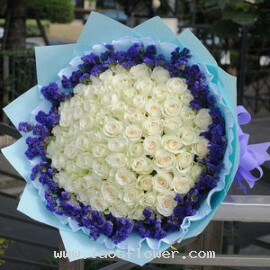 ..
A bouquet of 66 white roses accent with purple statice around the bouquet. Wrapped in blue paper and adorned with purple ribbon. This bouquet is good to send as a wedding anniversary gift or 66th birthday gift. Occasionally, substitutions may be necessary to create your bouquet due to the availab..